Historically, thousands of monarch butterflies roosted on a site at the westernmost edge of the Milwaukee County Grounds near the Menomonee River. Due to nearby development and construction, that number has declined in recent years. 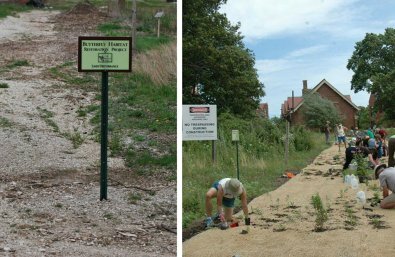 Given this decline, The Fund for Lake Michigan is supporting The Friends of the Monarch Trail and their project to restore this 14-acre parcel so that it can once again be a key migratory corridor for monarch butterflies. Currently, the site includes degraded wetland, streams, and drainage swales, as well as an abandoned road. With this funding, The Friends of the Monarch Trail will remove the road, restore the wetlands, and replace invasive plants with native species and trees.